Considering booking a cruise on the newest Celebrity ship, Edge? There are five things I think you must do on your Celebrity Edge cruise. Find out the perfect spot to read a book, the best kind of cabin, and the one dinner reservation anyone who is a kid-at-heart needs to book! Are you ready to hear about one of the newest cruise ships to hit the seas? I was invited to take a two-night press event cruise aboard the brand-new Celebrity Edge before she started her regular service. I took Lizzy along with me and we had a blast exploring each one of the decks on this new ship. After finding the perfect spot to relax, and the dining experience everyone must try, I put together my picks for what you must do on the Celebrity Edge. By far one of our favorite experiences aboard the Celebrity Edge was having dinner at ‘Le Petite Chef and Friends’. This is a truly fabulous experience, and completely unique from anything I’ve seen before. Dinner takes place at a Le Bistro Café, where the innocuous tables are carefully positioned under projections that come alive for your meal. You’ll watch at four chefs compete for the title of best chef, each preparing digital courses for you that then become the actual food you’re served for your salad, appetizer, main course, and dessert. There is a set menu with an alternate menu, but the “show” is created based on the set menu of four courses. The whole table comes alive and the scenes change as each chef prepares your next course. Le Petite Chef is a specialty dinner option where you watch your table animate to create your meal. As I said, this is probably one of the most unique dining experiences I’ve seen and I highly recommend it as an experience worth the vacation splurge ($55 per person). While it’s perfect for entertaining kids, even adults will enjoy the show! While the evening entertainment suggests that this is a space for adults, during the daytime it’s the ideal spot to lounge. The lounge itself has many cozy seating areas around the main room that features a three-story wall of windows, however, those who head upstairs will find the hidden Eden spots. There is a ramp that wraps around the entire room and it features many hidden seating nooks along the walls, facing the wall of windows. Unless you venture upstairs, beyond the main room, you might never know these other spaces exist. Eden on the Celebrity Edge is a beautiful lounge area with a three-story window wall. While along the ramp there are a few different seating areas, it’s the colorfully striped hanging bucket chairs that seem to be the star. We checked three times during our cruise to hope for them to be vacant and finally scored on our final day. While they’re fabulous spots to capture a colorful Instagram photo, it’s also a great place to take in the scenery and even curl up with a great book. Hidden seating nooks run along the ramp that surrounds Eden on the Celebrity Edge. I will say that Celebrity Edge isn’t a ship packed with outdoor, adventurous activities. You won’t find a race track like on the Norwegian Bliss, Instead, the Edge helps create an escape of relaxation. The Edge comes in at a 2,900-guest capacity, which is almost half the size of some of the newer mega-ships. One of these relaxation spaces is the Rooftop Garden, which sits at the back of the ship and is separated off from the resort pool section of the upper decks. At the Rooftop Garden, you’ll find many lounging couches and seating nooks, offering you a chance to relax amidst unique flower sculptures and a movie screen playing nature scenes. They even have live music most evenings. We spent one evening playing with the giant Jenga and bottle toss sets they have in the Garden. They also run movies at night in this space, they focus on classics and played Dirty Dancing the night we were up there. 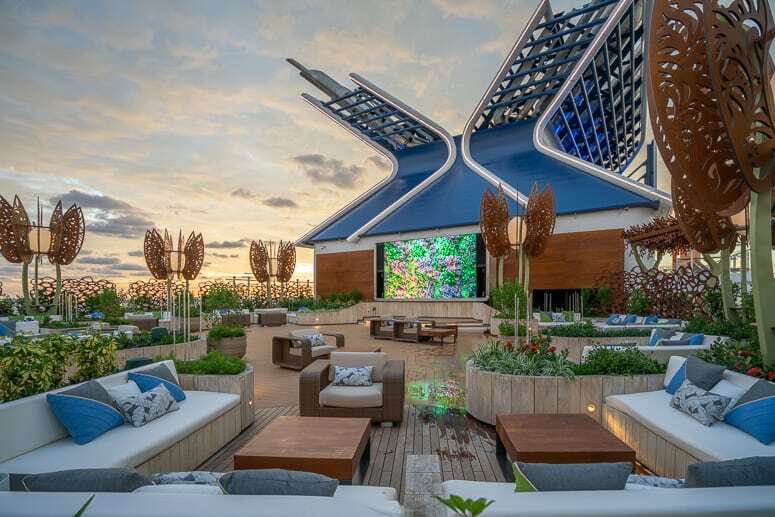 Rooftop Garden aboard the Celebrity Edge cruise ship. Celebrity reimagined their veranda (balcony) cabins on the Edge. They designed the rooms, called Infinite Verandas, with a balcony that is actually enclosed and part of your room. Instead of opening a door to walk out, you lower a half wall window by a switch to create an open-air space. The side walls are completely enclosed, different from the traditional balcony format of the floating wall sections that divide the rooms. These verandas can close off from your room with folding glass doors, in case someone wants to enjoy the fresh air without leaving the whole cabin open. In reality, this design helps make your room feel larger and the veranda space becomes more usable, especially if you’re having bad weather. Infinite Veranda on the Celebrity Edge. The Celebrity Edge features a very unique design, that is a first of its kind. A 90-ton restaurant and lounge space, called the Magic Carpet, hangs off the starboard side of the ship. It runs along tracks that allow it to move between floors. It often hangs out at the pool deck or on deck 5. The Magic Carpet hangs off the side of the Celebrity Edge. It can be a little disconcerting stepping into the Magic Carpet as there is a gap between the ship and the carpet, giving you a three-inch peek at the ocean below you. You can even make reservations to dine. If you’re feeling daring, try leaning against the slanted window side walls while looking at the ocean below! You can get a drink, and even dine a la carte, on the Magic Carpet. The pool deck on the Edge is definitely worth spending a bit of time enjoying. While the main pool is certainly inviting, I think one of the most unique features is the martini glass shaped hot tubs that are elevated above the main pool deck. They’re a fun spot to enjoy a drink or to watch the sunset. I’ll also mention that if you’re a runner (or walker) taking a stroll around the ship fitness track will offer you some fun overlook views. I really love the open feel for the pool deck on the Edge and found myself gravitating to walk around it, even if I wasn’t going for a dip. Pool deck at night aboard the Celebrity Edge cruise ship, the newest Celebrity ship in their fleet. If you’re sailing the Edge, definitely be sure to download the Celebrity Cruises app. The app didn’t really work for me when I sailed earlier this year on the Silhouette, but for the Edge it was perfect. It shows you all the times for shows and events and helps you see your daily plans. You can also check-in with the app, and take your photo with your phone, allowing you to have your boarding document scan code on your phone and get expedited boarding. Download the App before your Celebrity cruise! Are Celebrity Cruises Good for Kids / Families? This has been my second cruise with Celebrity, both times I took my daughters with me. Before cruising with Celebrity, I wouldn’t have thought of them as a cruise line for families, however now after two, I would definitely recommend it. I will say that Celebrity cruise ship spaces and shows seem to be tailored towards adults. However, their Camp at Sea programs are done very well, and their focus on the kids is amazing. They’ve designed kids’ clubs that are more about activities and engaging with your kids rather than a drop-off daycare space. They run programs dance parties, pizza making, talent shows, and scavenger hunts. I’ll also say that the staff seems to be more involved with your kids since there are fewer kids on board Celebrity ships. It’s a drastically different experience than what kids would find on a Disney Cruise. I’d say that the activities and shows are designed more with adults in mind. However, families who enjoy relaxing in quiet spaces, enjoying great meals together, and who have kids that enjoy kids’ clubs are probably the ideal families for Celebrity Cruises. Celebrity Cruises can be great for families! If you’re hoping for an open-wide ocean view from your room, avoid deck 12. Deck 14 overhangs deck 12 and the support beams run along deck 12. If you watch my room tour video above you’ll see the view. I also noticed some traffic/cart noise from the café above our room. I’m working on an upcoming post about the best and worst cruise cabins to book. Do you have any questions for me about the new Celebrity Edge? 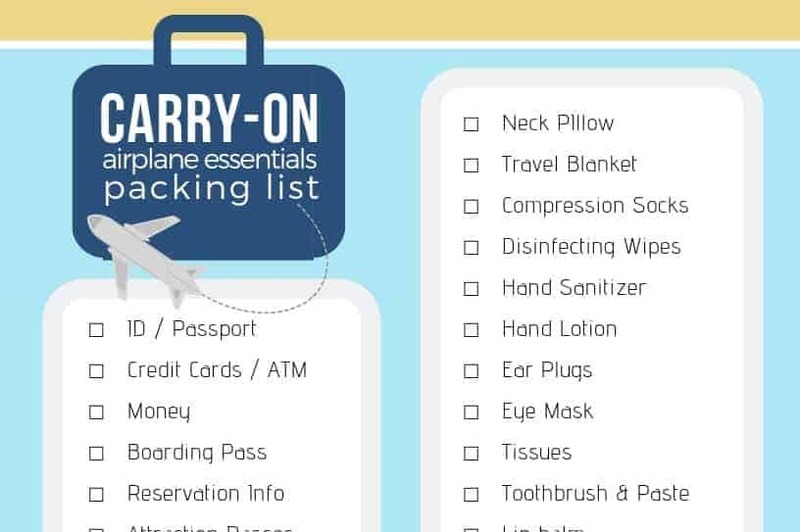 Keep in mind that the Edge has a 2,900 passenger capacity, which helps it not feel like a mega-ship when comparing it to the 3,900 passenger Norwegian Bliss and the 5,400 capacity Oasis ships in the Royal Caribbean fleet. Overall, it’s a beautiful ship that is perfect for a relaxing escape. Things to do on the Celebrity Edge cruise ship.